As the technology for the evacuated metal-glass tube heat-collecting elements (also known as linear receivers) for parabolic troughs used in CSP generation continues to evolve, GEAR Solar continues to improve on its patent-pending technology that has resulted in remarkable optical values and long-term thermal stability. GEAR Solar linear receiver utilizes its patent-pending glass-to-metal seals and metal bellows to accommodate for differing thermal expansions between the steel tubing and the glass envelop. They also help achieve the necessary vacuum-tight enclosure. 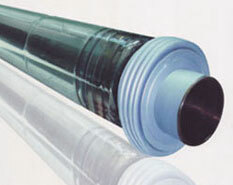 The vacuum-tight enclosure primarily serves to significantly reduce heat losses at high-operating temperatures. 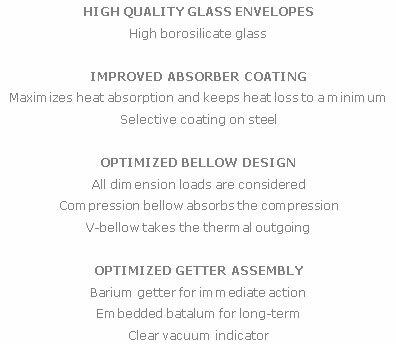 It also protects the solar-selective absorber surface from oxidation facilitates high solar absorptance as well as low thermal emittance. 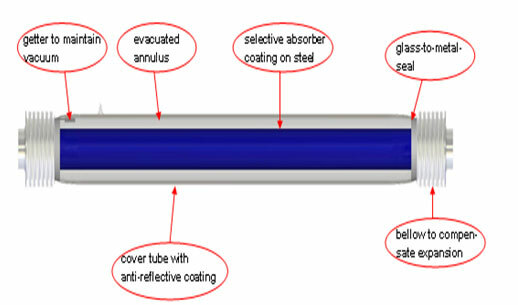 Our selective coating on the steel tube has excellent solar absorptance and a low thermal emittance for reducing thermal radiation losses. 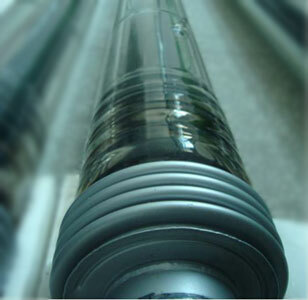 The glass cylinder features an anti-reflective coating to maximize the solar transmittance. Getters, metallic compounds designed to absorb gas molecules, are installed in the vacuum space to absorb hydrogen and other gases that permeate into the vacuum annulus over time.